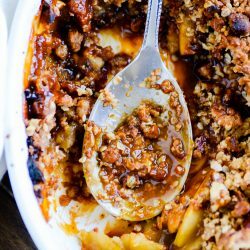 Here’s a recipe for a warm, gooey, comforting crisp full of hearty oats, juicy apples, and cinnamon morsels. Here’s my secret: I don’t. Nope. I am a total glutton for anything sweet. You’d think I’d maybe get sick of all the sugar, or (at the very least) become a little desensitized. My family totally has, but I don’t think I ever will. I could eat dessert every meal of the day, honestly. So when I make a dessert that has both oatmeal and apples in it?? Well, I give myself a pat on the back. Because that’s practically health food in my book! I don’t reallllllllllllllly consider this health food. Not technically, anyway. But, I mean, there are apples in there. I’m just saying. ???? 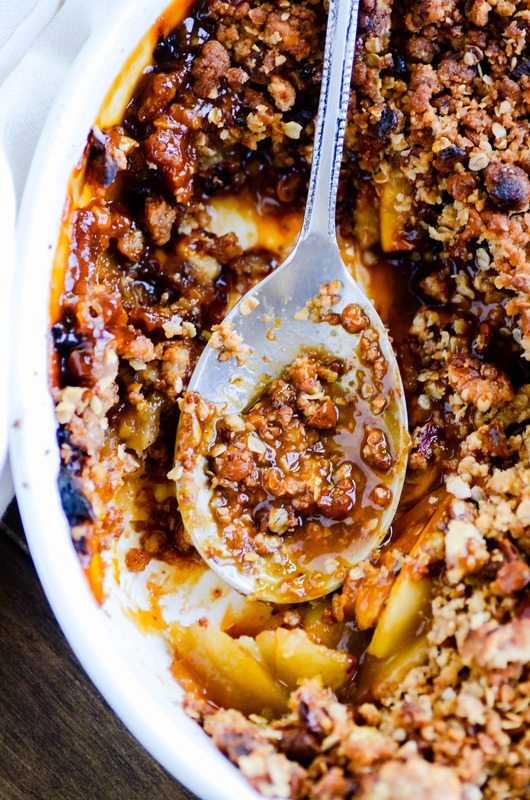 This apple crisp is essentially the same basic recipe I’ve been using for years. It’s more amazing than most basic apple crisp recipes because there’s a little something extra in the topping: crushed up graham crackers. Seriously, it makes all the difference! They add a little bit of extra crunch and a little bit of honey flavor that’s just barely there, but really puts this recipe over the top at the same time. So I’ve taken that beloved recipe and cranked it up a notch. Because today we’re adding cinnamon morsels. Have you ever baked with cinnamon morsels? They’re just like chocolate chips, but cinnamon. I buy them at Target or Walmart right beside the chocolate chips in the baking aisle. I love using them in bread and cinnamon rolls and occasionally in fudge. But they really shine in this recipe, because they melt down and seep into every bit of this crisp– into the crispy topping and all around the apples. It’s apple crisp heaven! Grease an 8-inch or 9-inch baking dish with nonstick cooking spray. Mix together the oats, graham cracker crumbs, 1/3 cup brown sugar, 1/3 cup flour, pecans, and cinnamon. Drizzle the melted butter over the mixture and stir until a crumble forms (I like to use my hands for this). Stir in the cinnamon chips, and set aside. In another bowl, mix together the 1/2 cup brown sugar, 2 tbsp flour, and 1/2 tsp cinnamon. Add the apple slices and toss to coat. Layer the apple slices in the prepared baking dish. Top with the crumble topping. Bake for 35-40 minutes until golden brown on top and bubbling along the edges. Let cool for 10 minutes before serving warm. Beautifully put. The bottom line is we’re still Americans and that’s what matters. Also, this apple crisp looks so good I want to crawl through my computer and eat it. what are cinnamon chips? Are they the little red hot candies we used to eat or something else? This look like a perfect recipe for today! Thank you for your timely post. We really can make a difference. Be a good neighbor. Love your spouse and your kids, teach them to be kind and respectful. Help others. Smile. We do live in a wonderful country. I have a bag of cinnamon chips in my cupboard right now that were just searching for a purpose in their life. I shall use them in this! Delicious! I too was surprisingly emotional last night. I didn’t expect that. I really appreciate your words in this post. Thanks for keeping it real:)! I’m proud to be an American and thankful for the freedom to raise my kids according to my beliefs :) And this crisp…couldn’t look any more delicious. 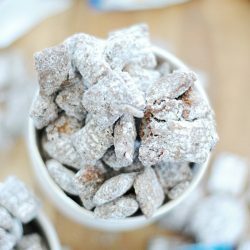 Love the idea of cinnamon chips and graham crackers in the topping – can’t wait to try this!! 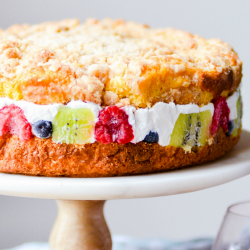 A great all-American dessert :) Sounds delish. Thanks for sharing! First I’ll say that your apple crisp pictures are making me so hungry! Looks so appetizing! Second, I’ll say, that every four years I get a little choked up watching the country come together and participate in democracy and celebrate our freedoms. My candidate of choice hasn’t always won, but there is something so thrilling about the whole process. It’ makes me proud. I love your pictures Ashton! They’re simply beautiful and the staging in them is spot-on! Plus, who doesn’t like apple crisp? It’s da bomb. Ashton – that was SO beautifully said! 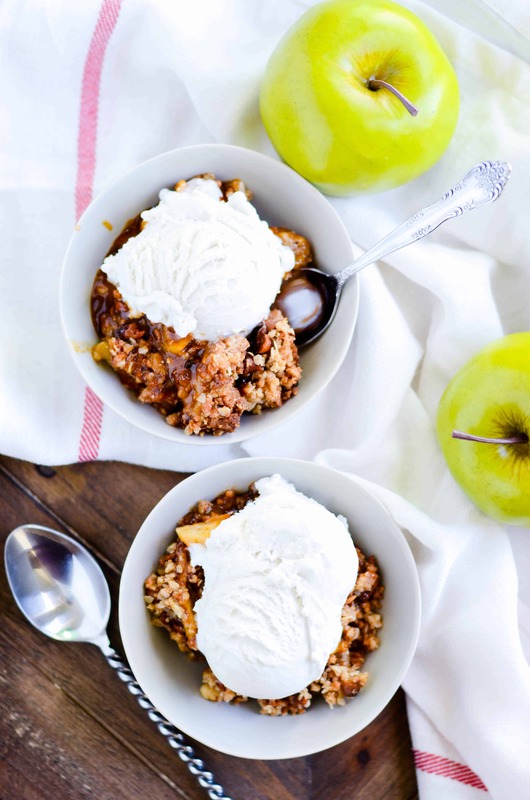 and this apple crisp is a great way to celebrate that! ashton my dearest. did you make this crisp just for ME? I think you did. 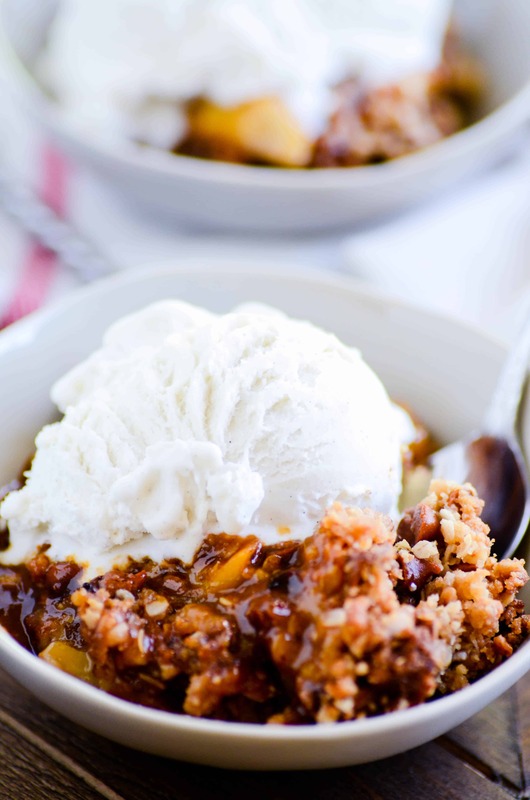 apple crisp is my favorite dessert (next to apple pie!). I haven’t made apple crisp yet this season, but I plan to make it for thanksgiving dessert!!! And yes, I am SO thankful for our right of voice. We are very lucky to have the vote. I also woke up sad on Wednesday morning, but I guess I can spend the next 4 years mad, or focus on things that bring me joy. It can be hard, but I know I’ll get over it soon-. It’s incredible to be an American. Very well said, Ashton. And the Apple Crisp looks divine! Well said Ashton! Wonderful all-American recipe too. Looks delish! Very well said. No matter our beliefs, we are all truly blessed to live in a country that allows us great freedom. And this apple crisp? Perfect! Your staging is getting so good–I need you to come give me some lessons! I just made this recipe and it smells delicious!! My question is…did you cover your dish while baking? I didn’t and the cinnamon chips are totally browning and turning VERY dark around the edge of the dish. Any ideas?? Has anyone tried making this in a crock pot? I think this would be a great replacement dish for the 4th instead of apple pie. Thanks!